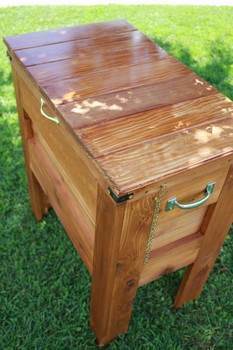 Wooden ice chests or coolers can be made from recycled pallets, as a couple of the plans below use, or cedar that will age nicely with time. These coolers generally have a rustic appearance, but could also be made with nice wood for a great heirloom. 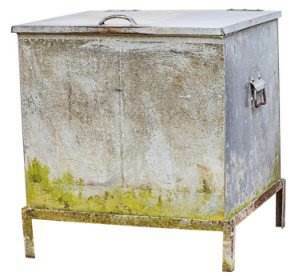 Here is an old vintage ice chest. Most of the wooden ice chest plans are styled in this basic shape with the 4 legs. 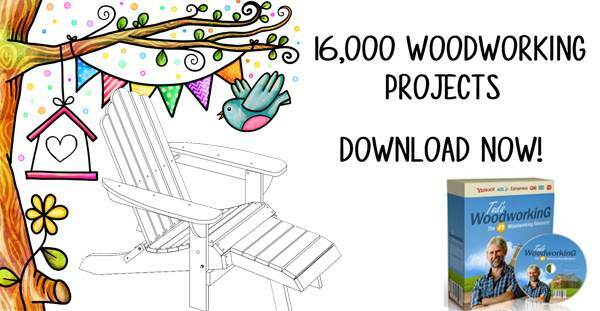 Most of these plans use wood to build around a styrofoam or plastic ice chest. That makes the ice chest easy to insulate. The result is a rustic, aged-looking ice chest with the safe modern convenience of a purchased cooler - a combination of antique and modern. If you will be using a styrofoam cooler, a 2" thick one should do the trick. The blue styrofoam is better to use for this project because it is denser than the white, making it easier to cut without falling apart. If you do use a white styrofoam chest, use a hot knife to cut it to eliminate rough edges and the messy beads. Also try to find a very square cooler. The squarer your cooler is, the easier the ice chest will be to build around it. An ice chest project will take a good weekend to build, about 10 to 20 hours. And if pallet wood is used so there is no cost for the wood, then the cooler and other necessary accessories should cost under $50. Any of the free plans below can be adjusted to fix either a styrofoam or plastic cooler. The lid of your cooler will need to be removed, as will any handles. Basically, the plans will walk you through cutting the wood so it will fit your purchased cooler. Sand the wood and enclose the chest. Most plans allow for a drain which would be a very good idea. They range from attaching a rubber hose to the drain to using a sink drain with a rubber stopper on a chain. Then the top of the cooler is attached to the wooden lid. Adding hinges completes the assembly and it's ready to stain or at least waterproof if it doesn't need staining. 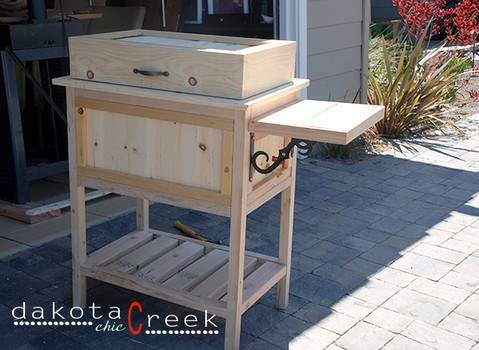 This project is for an attractive ice chest made out of cedar wood that holds a Styrofoam cooler plus has a place to hang an ice scoop and bottle opener on the outside. 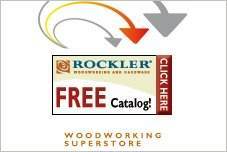 Choose cedar, redwood or pine to create a wooden chest that can hold a plastic or styrofoam cooler. 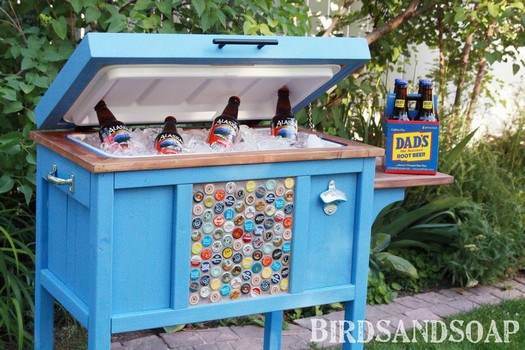 Build this artsy ice chest that has a side shelf, attached bottle opener and a spout to drain off water. Box is made out of basic lumber and holds a plastic cooler. Wood pulled from a scrap pile was used to built this good looking ice chest that houses a plastic cooler and has a side shelf, mounted bottle opener and drain. 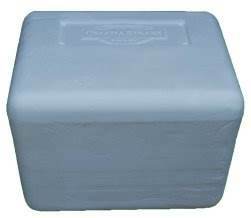 This attractive ice chest is designed to hold a 10.5 gallon galvanized tub that measures 26 3/4 inches long, 15 inches wide and 9 inches high. Re-purpose a whiskey barrel by cutting it in half then adding legs, ice and a table top. 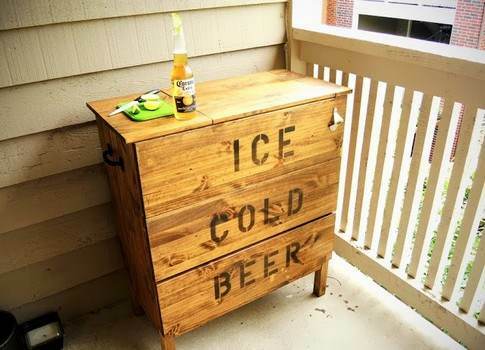 Turn an old wooden pallet into a tall ice chest filled with your favorite beverages. Get the party started with an ice chest built from wooden pallets plus a plastic ice chest. 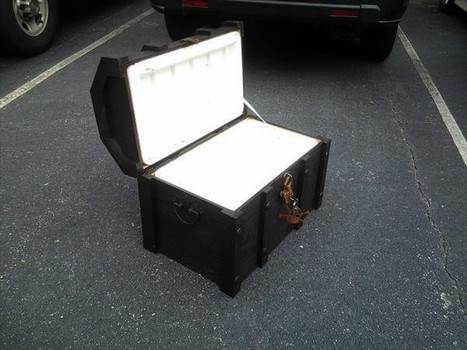 Build an ice chest that looks like a pirate chest featuring skull and bones on the lid. 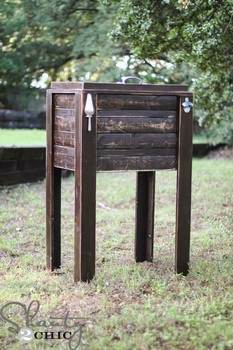 This portable wooden ice chest offers a side prep area and a lower shelf for storage. 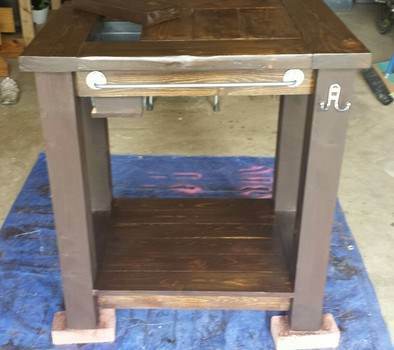 Build a grilling prep table with a built-in cooler plus towel holder and storage shelf. 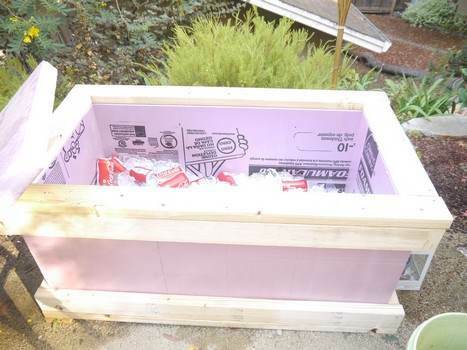 Keep cold drinks handy this summer by building an all wood cooler using this detailed project. 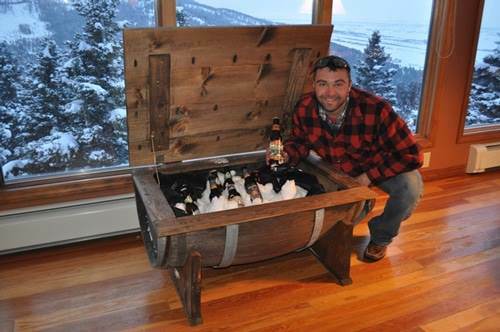 This handsome beverage chiller is built from cedar wood and designed to last a life time. 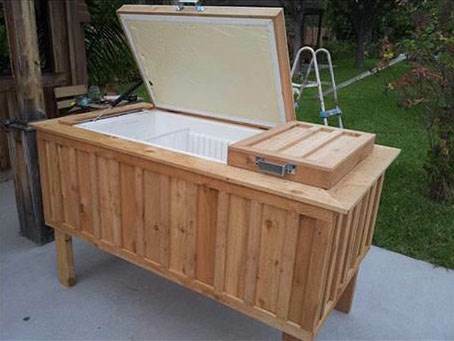 Here are plans for turning an old refrigerator into a strong and sturdy wooden cooler. 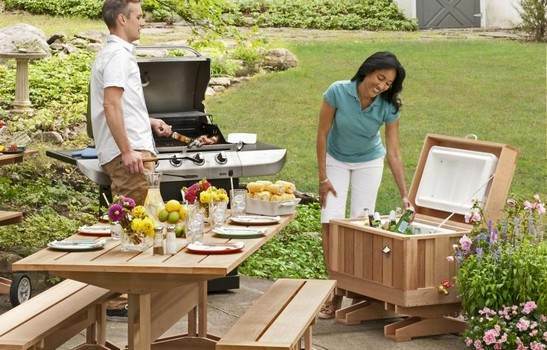 Build a wooden cooler large enough to hold five cases of beverage for a large outdoor party. 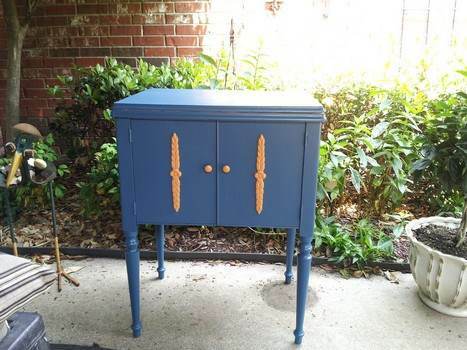 This plan takes an old sewing machine cabinet and turns it into an attractive ice chest. 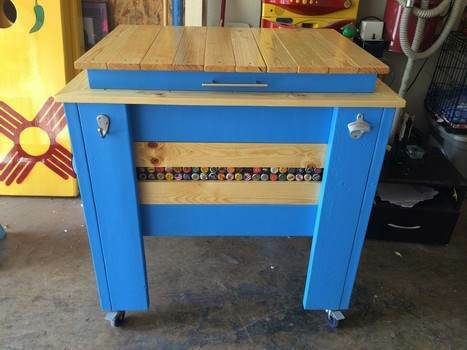 This cooler on wheels in built using an old mini fridge, re-purposed wood and bottle caps. 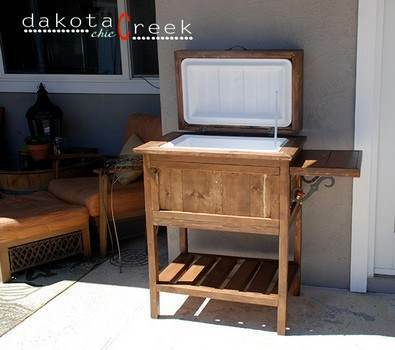 Use this simple step by step project and create a handsome wooden cooler with prep area. 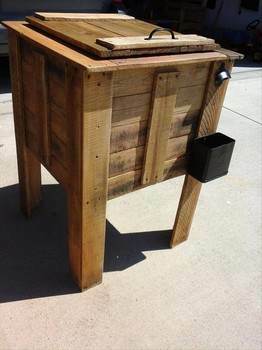 Save time and money using old wooden pallets to build a rustic cooler for patio or deck. 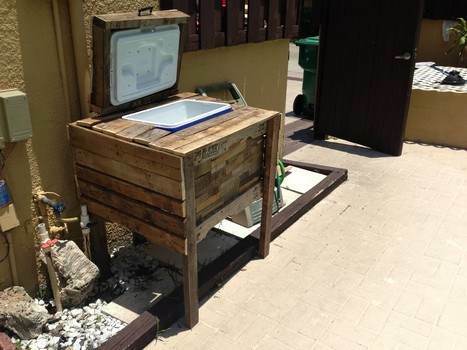 Build this cooler in just a few hours by using re-purposed wooden pallets.